On net this nominal price is up by around 60% but then the consumer price index has risen by 53% over the same period. What I see is a lot of volatility but no long-term change in real terms. And an increase in volatility risk without an accompanying increase in price is the same thing as a loss…unless of course you’re risk loving rather than risk averse. Market has let off a bit, but really not much off recent highs. Put another way, the market has trimmed its position, but traders don’t really believe the tariffs are going to take effect or inflict lasting damage. At least not yet. I don’t know, you think this guy has a future in politics?? I’m being a smart-aleck, I actually think cooler heads are warranted at the moment. Did I mess up my html bold tag for the millionth time?? I guess some kind of a format change. If I messed that up I’m sorry. As with pork, it looks as if the cost of food is going down for Americans as the Chinese bury their citizens in food price increases. Or am I misconstruing the charts? Yes soybean will be more expensive to the Chinese but I’m sure they can find other affordable forms of food. It is not like my kitchen is overrun with soybean products right now. I agree with you to a degree there are plenty of food substitutes, but let’s also have a reality check, American Chinese have different tastes and diet than mainland Chinese. You’re probably going to argue this with me, that’s fine (and before you start in, yes I am talking household food—not what they dish out USA located restaurants). I’ve seen both USA Chinese eating habits and mainland Chinese eating habits up close—you’re not going to convince me otherwise. hahaha, it’s going to take me awhile getting used to not using bold to differentiate. It’s obviously not a big deal, but I found with cynical sarcasm vs good natured humor etc hard to differentiate online I like differentiating with html tags. But as I said, it’s not a big deal, just me getting used to it. Your weird little report here did not say eat more tofu. But let’s say Americans ate more tofu and less pork as you suggest. That would drive hog prices down even more. Maybe you should actually take a very basic course in economics as you clearly have no clue. Did I say anything about pork? Give the soybean farmers a little boost and have some tofu with your dim sum. We need to sacrifice a little for the future of the American economy and the children. The IP Commission Report is a “weird little report” to you? We need to sacrifice for the future? WTF are you babbling about? Look I had sushi for dinner and there was no harm at that even if I just iincreased our bilateral deficit with Japan. I’m sure you will be offended for your usual weird reasons! 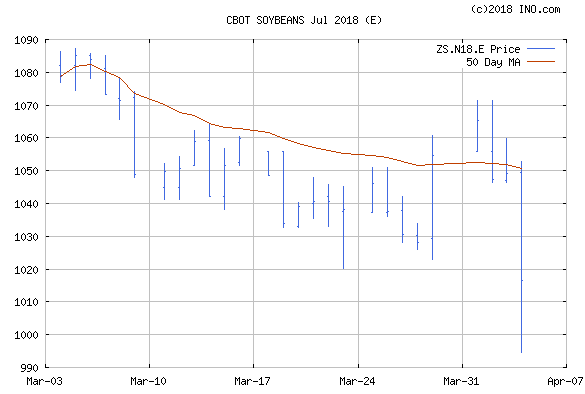 Soybeans are a commodity and i would venture to guess the demand is not all that elastic. Thus, one country putting tariffs on them would seem to move shipments around, but not much else. I hate to second guess futures markets, but could this simply be a case of the participants not understanding the underlying economics? I’m tempted to second-guess the market on this. Recall what happened to equities futures immediately after Trump was elected? Something tells me that you have not exactly worked out the economics implied by your claim that soybean demand is not all that elastic. But be of good cheer – Wilbur Ross has not either. And something tells me you are in danger of conflating the effect on price to the consumer with the effect on price to the producer. Let me know if you change your mind after drawing some simple supply and demand curves. From the farmer’s perspective this announcement comes at a very bad time because over the next few days farmers must decide what and how much to plant, so the announcement by the Chinese injects a lot of uncertainty into planting forecasts. Prior to this announcement farmers were leaning towards increasing soybean acreage and cutting back on corn. If you’re going to plant soybeans, then you need to get them in the ground by late April at the latest, or you’re screwed. That’s not a lot of time to arrange loans, buy seed, apply herbicides and fertilizers, till the soil and sow the crops. You can hold off on corn until mid-May, but you lose yield quickly with each planting day beyond the 1st of May. So again, you’re screwed. The bottom line is that even if things get resolved some time over the next few months and the Chinese end up not imposing tariffs on soybeans, the damage will still be done as far as the individual farmer is concerned. The commodity brokers and grain dealers may end up doing okay, but a farmer who guesses wrong could be done for. CoRev Double cropping goes back to medieval times. Yes, I’ve heard of it. The Chinese tariffs are obviously targeted at Big Ag in general, and Iowa in particular. It’s hardly a coincidence that the US Ambassador to China is the former longtime governor of Iowa. And in Iowa they plant corn and soybeans almost exclusively because the soil is ideal for those crops. The supporting infrastructure is geared towards corn and soybeans as well and really isn’t set up to handle other crops. The routine is that you plant soybeans and corn in mid-April to mid-May. Corn is done growing by late August, soybeans a little later. It takes at least a month for the crops to dry in the fields, so harvesting usually begins in late September thru October. November is a mad rush to get the corn and soybeans to market and down the Mississippi River before the river freezes and the lock & dams shut down. I wonder if Menzie Chinn bought soybeans today, thanks to Trump. Knowing you and your usual stupidity you wrote soybean off your diet. Healthy food at reasonable prices is not exactly PeakStupidity’s style! American firms shouldn’t be coerced to give up intellectual property to the criminal Communists for an opportunity to gain loyal future Chinese customers to their brands. That’s not how it’s done in free and open markets. No one is coercing anyone and your notion that we need to protect monopoly privileges is contrary to free and open markets. Come on Peaky – we know you are really stupid but it seems you have no clue what the words you write even mean! Pgl, you’re very naive about China and 1.3 billion future consumers. What’s really stupid is your socialist beliefs. Why make everyone poorer? IP rights encourage innovation and reward entrepreneurs – it’s America’s virtuous cycle of big risks and hard work to lead the world in innovation, invention, and entrepreneurship. Top five commodities in Kern County and their values: Grapes-$1.69 Billion; Almonds-$1.3 Billion; Citrus-$825 Million; Pistachios-$770 Million; Milk products-$580 Million. Seems China will hike tariffs on at least three of those..
Now, which country is Kern’s number export partner? That would be China, followed by Mexico (bye bye NAFTA? ), Hong Kong, Japan, and Korea. And “My Kevin”? He thinks the Trump tariffs are a swell idea that will make China think twice before messing with Trader Trump and all those patriotic Trump voters back home. The Communists are smart targeting Trump states – Navarro estimates the U.S. would have 2 million additional good jobs if China didn’t steal intellectual property, for production, export, and consumption. And, why should American entrepreneurs spend on R&D and production when they can buy their innovative products from Chinese producers, who stole their IP rights? Instead of a high paying job, the American innovator can buy their innovations from a Chinese worker earning much less, while working at McDonald’s, Walmart, or Uber to earn a living. If US courts do not protect IPR, China and many other countries’ courts do. More American arrogance. Most people realize that other nations do R&D and create new ideas. But not PeakIgnorance. Continue on with your spin as you ignore the valid points others are making here!!! With an unemployment rate above 11%, McCarthy’s constituents are willing consumers. Navarro estimates? We have seen his so called estimates and they are dumber than ever your incessant rants. BTW – do you have any clue where Nike makes its shoes? Try China. That way they get low cost labor and still charge insanely high prices to American consumers. Oh wait – did your political masters forget to tell you that? Pete Wilson destroyed the California GOP with Prop 197. Republicans have struggled to be relevant again. Trump will end all of that and California will remain blue for at least another 30 years! Subheadline When panic fizzled, prices sizzled. Also from the wrap up, Argentina drought continues. Soybean production projection further down – big. My comment not from feedstuff, China may have misread the retaliation. So sad.